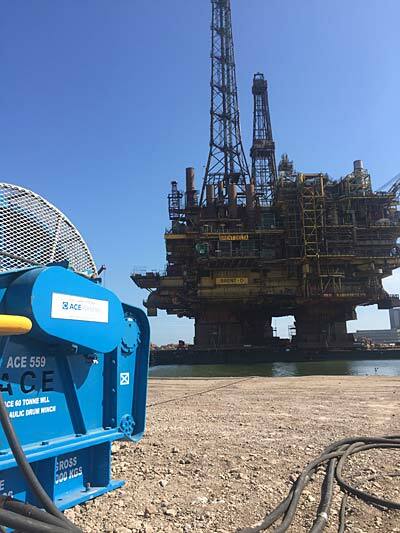 Global deck machinery specialist, ACE Winches has successfully mobilised a 6-point mooring system to anchor the Iron Lady Barge being used on the Brent decommissioning project. The equipment, designed and manufactured by ACE Winches at their global headquarters, Turriff, Aberdeenshire is now in situ and being supported by a team of ACE Winches offshore personnel. ACE Winches manufacture a range of standard and bespoke drum winches, available in single or double drum configurations. Drum winches are designed to be utilised for hoisting, deployment, mooring and general pulling applications and, depending on the size and power requirement, can be hydraulically, electrically or pneumatically driven. As part of the Brent Delta decommissioning project the 24,000-tonne platform topside is to be transferred to a 200-metre long barge, the Iron Lady, being moored at the client’s specialist facilities in the North East of England. 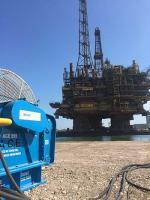 An ACE 6-Point Mooring system is in place to assist and maintain the positioning of the barge during operations to transfer the platform to the shore side. The ACE 6-point mooring system incorporates ACE hydraulic drum winches ranging from 75-tonne WLL to 25 te WLL, powered by 6 closed loop diesel hydraulic power units. The Shell-operated Brent field, located 115 miles north-east of the Shetland Islands, has produced around three billion barrels of oil equivalent since production started in 1976, which is almost 10% of UK production. The Brent Delta topsides, located some 186 km off the north-east coast of Shetland, sat on a three-legged gravity-based structure which stands in 140 metres of water.